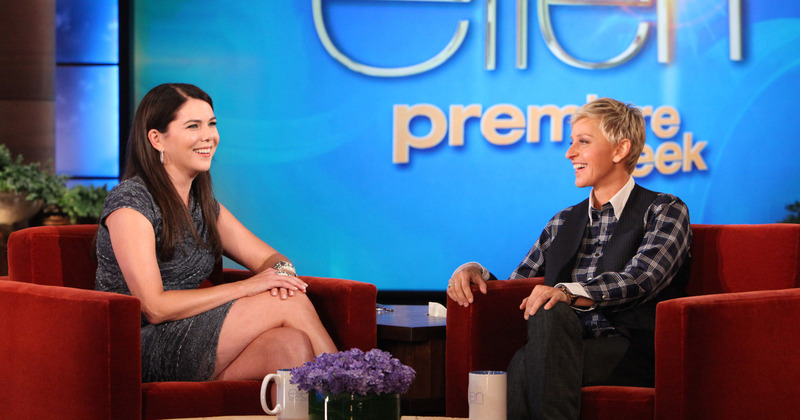 Lauren Graham and Ellen DeGeneres Comedy Coming To NBC!!!! Lauren Graham is amazing. Whether she’s Lorelai Gilmore (‘Gilmore Girls‘) or Sarah Braverman (‘Parenthood‘), hell even as Joan Baxter from ‘Bruce Almighty‘ or Maggie from ‘Because I Said So‘, I’ll watch her, and I’ll love her. Wash, rinse, repeat. So naturally, I’m seventeen levels of excited that she is going to be starring in, and co-writing, a late-night host comedy from mega-successful Ellen DeGeneres & NBC. NBC is not ready to let Lauren Graham slip through their fingers as ‘Parenthood‘ makes it’s final lap around the peacock. ‘Kate On Later‘ is reflecting the lack of female hosted late-night talk show. Graham will co-write with Liz Tuccillo (‘He’s Just Not That Into You‘) and produced by Ellen DeGeneres. So far, the series has made it to a script commitment from Warner Bros. TV and DeGeneres’ A Very Good Production. Tuccillo is executive producing with DeGeneres and A Very Good Production’s Jeff Kleeman and Graham will co-executive produce. The show will center on Kate (Graham) who thought her day job was all her life would amount to when an opportunity arises that’s bigger than she ever dreamed possible. But that opportunity means she’s going to have to break one of the last remaining glass ceilings – the world of late-night network talk shows. A Very Good Production has more than Kate in the ring at NBC this season. Another ‘Parenthood‘ alum, Monica Potter will be starring in that venture that has a pilot production commitment. ‘Kate On Later‘ is Graham’s second collaboration with DeGeneres’ company. Last season, ‘Someday, Someday, Maybe‘ was adapted from Graham’s debut novel. She wrote the script and sold it to CW. This entry was posted on Monday, December 1st, 2014 at 2:47 pm	and is filed under News, Television. You can follow any responses to this entry through the RSS 2.0 feed. You can skip to the end and leave a response. Pinging is currently not allowed. « Release Dates For Netflix Series Released!! !